The fun created in Smiley couldn't outweigh the soulless core that was revealed all too early. Finally, a slasher for the cyber-obsessed generation we live in, knowledgeably created by the geekers that have amassed millions of YouTube views in an effort to rule the internet. Director Michael J. Gallagher is responsible for the comedy channel “Totally Sketch,” Shane Dawson you may recognize from “Shane Dawson TV,” and Toby Turner of “The Annoying Orange” fame all provide social commentary about the 4chan viewing, meme-crazed teenagers who waste hours surfing the internet. 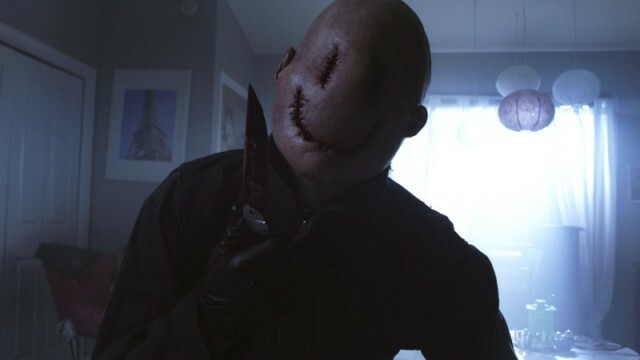 Smiley is their techie brain-child which exploits the internet’s wicked ways, creating a slasher villain who brings “trolling” to horrific new heights. This is what happens when doing it for the “lulz” goes wrong, and when emoticons attack. So for those lost in today’s current trend of LOLcats, memes, YouTube sensations, misspelled text, made up words, and the art of “trolling,” consider yourself far outside the intended demographic of Smiley. Stuffed with internet jokes and soaked in nothing but nerdism, the digital commentary will be lost in a matter of minutes to clueless viewers, leaving only a diluted slasher film which makes little to zero sense. As someone who visits Memebase daily, has seen “Charlie The Unicorn” a billion times, and has a ROFLCOPTER that goes SOI SOI SOI SOI…yeah, delving into the seedy subculture of internet deviants was something absolutely not lost on me. There are some sick, twisted, morality lacking people who hide behind their computer screens “trolling” (basically, the act of being a dickbag on the internet for no reason), and the killer Smiley is a brilliant manifestation of their malicious acts in real life. But, aside from a slasher conception I actually don’t hate, young director Michael J. Gallagher breaks the number one rule so many other novice genre directors make – respect your audience. Horror fans are a special breed that can detect passion and devotion from a filmmaker’s standpoint in only a matter of minutes, expecting to be treated a certain way. Directors have a limited window to establish themselves, but Gallagher shoots himself in the foot early on by turning what should be a complimentary scare tactic into a massively overused, front and center failure. I’m talking of course about the easily insulting “jump scare.” Gallagher doesn’t understand these only work when peppered in as a change of pace, throwing the viewer off from already built tension. Instead, the ONLY “horror” Gallagher implements in Smiley utilizes solely “jump scares,” testing our patience while keeping us on edge, but not in a rewarding or appreciative way, as aggravation levels rise. Gallagher’s only weapon in his tiny horrific arsenal backfires mightily in the end, showing an out of touch inexperience in pleasing this particular audience. Smiley doesn’t stop nose-diving there though. Gallagher and fellow writer Glasgow Phillips (South Park) script one hell of a nihilistic portrayal of “trolling” come our final act, but in thinking outside of the box and believing they created the next Inception mind-blower, I would rather a simpler and crazier end, which actually seems plausible for only a short amount of time. For the sake of some of you who will still set out for theater viewing, I’ll refrain from anything spoilery, but Gallagher again falls prey to common flaws so many ambitious yet stale slashers accentuate today – stupidly overcomplicating everything. So how do our young YouTubers hold up on-screen? Well, actress Caitlin Gerard is tasked with characterizing main character Ashley, the crazy girl no one believes is being hunted by an internet stalker with a smiley face carved into his, well, face, while coming off of psychiatric medications. She commits every clichéd act in the business, hams up the innocent college girl personality entirely too far, but seems entirely watchable against her more annoying counterpart Proxy (Melanie Papalia). I get the whole nerdy girl persona trying to be achieved, but her character turns out to be nothing but a more tech savvy version of everyone’s favorite prego, Juno. Aside from our two damsels, the internet actors are pretty forgettable and don’t really spark anything special, as I don’t even know who Shane Dawson is. Is that a bad thing? Thankfully, Roger Bart is there to pull their weight when he can, injecting his lightning quick wit and inviting charm into a professor character subtly advancing the story with teachings of reason. I have no doubt Smiley will ascend to “cult classic” status amongst certain niche crowds, populating crazed and obsessed message boards somewhere while drawing worship by fans for being relatable horror which panders to a growing demographic, but the fun created in Smiley couldn’t outweigh the soulless core revealed all too early. It’s a bummer too, because I love the idea of Smiley himself, an evil force created by all the hate-filled acts committed on the interwebz. Instead, I’ll leave him on YouTube where he belongs, as nothing but a viral trailer with so much unique potential.